Quality is extremely important in industries like optical and display. Swift Glass offers a wide selection of optical and display glass so you can find the properties and manufacturer that work best for your application. We also supply color filters manufactured by Schott, Kopp and Hoya for photography, color stage lighting and optical instruments. SCHOTT D263® is a thin borosilicate glass with low alkali content produced with extremely pure raw materials making it highly chemical resistant. It has excellent surface quality that can be coated without any post-process surface work. The combination of these traits makes D263® highly versatile. B270® crown glass is suitable for a variety of different market demands – especially biotech applications. It offers high chemical stability and high transmittance and has a firepolished surface. BK7® glass is an extremely common crown glass used in precision lenses. BK7 performs will in chemical tests and no special handling is required. Eagle 2000®: EAGLE 2000® glass is a lightweight AMLCD Alkaline Earth Boro-Aluminosilicate glass with low density and a low coefficient of thermal expansion. It features excellent flatness and high surface quality that is indispensable for high resolution applications. Eagle XG®: Eagle XG®is the industry’s first LCD glass to contain no added arsenic, antimony, barium or halides. It offers low-density, high chemical durability and a pristine surface ideal for high-resolution displays. Starphire® glass is the ultimate in ultra-clear glass technology. It contains less than 10 percent of the iron present in conventional glass. Because of this low iron content, Starphire® glass allows more light to pass through it than conventional clear glass. But what makes Starphire® glass truly unique is its blue edge. Unlike conventional glass, which becomes greener as thicknesses increase, Starphire® glass gains a distinctive blue edge while the surface of the glass remains ultra-clear. 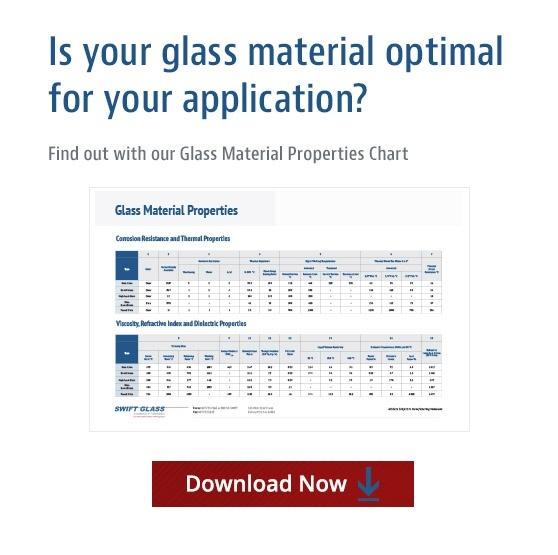 View the table below for a complete list of our optical and glass materials. If you have any questions, feel free to contact us today. SGG Diamant transmits up to 92% of visible light, depending on thickness and is a high quality clear float glass with exceptional clarity and high light transmission. Low-Iron Soda Lime glass provides high light transmission, can be AR coated for super high transmission, can be chemically strengthened, and has good flatness and no green tint. A reflective glass either first or second surface reflectances up t o 94% visible. A heat resistant grey-green tinted glass made to provide the correct eye protection for every welding operation. The shade numbers 1-14 refer to the density needed for the different welding operations. The higher the number, the darker the shade. X-Ray Shielding Glass is superior to acrylic in radiation protective applications. Compared to acrylic, lead X-Ray glass is much thinner and lighter. Acrylic also can yellow with age and be easily scratched. Glass is available in laminated formats where impact safety is a requirement. Lead glass is effective for x-ray shielding and for other forms of radiation shielding due to the attenuation of ionizing photons as a result of lead’s high atomic number. Lead Glass is used when a clear view and radiation shielding is of absolute priority in diagnostic, therapy, isotopic or nuclear radiation sources – used for medical treatment, imaging, testing, inspection, experimentation or energy production. Lead radiation shielding glass is effective for x-ray shielding and for other forms of radiation shielding due to the attenuation of ionizing photons as a result of lead’s high atomic number. Lead Glass is used when a clear view and radiation shielding is of absolute priority in diagnostic, therapy, isotopic or nuclear radiation sources – used for medical treatment, imaging, testing, inspection, experimentation or energy production. Optical filters selectively transmit light in a particular range of wavelengths, (colors,) while blocking the remainder. They can usually pass long wavelengths only (longpass), short wavelengths only (shortpass), or a band of wavelengths, blocking both longer and shorter wavelengths (bandpass). The passband may be narrower or wider; the transition or cutoff between maximal and minimal transmission can be sharp or gradual. Optical filters are commonly used in photography (where some special effect filters are occasionally used as well as absorptive filters), in many optical instruments, and to color stage lighting.